Although some nationalists have at times hand-waved the problem away, I have for a long time been convinced that an independent Scotland might find it hard to be allowed membership of the EU (even though refusing it would be ludicrous, given that Scotland has been part of the EU for my entire life), simply because Spain is afraid that Catalonia and Euskadi might leave, and they want to make the independence option seem as unattractive as possible. 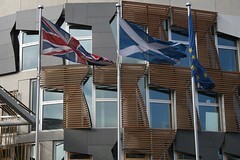 Lawyers for the EU said an independent Scotland could be treated as one of two successor states, and that a separate seat for Edinburgh would require only a majority vote among member states. Standard procedure for external accession candidates such as Croatia, which enters in 2013, involves the unanimous backing of all EU governments. I don’t see any reason why Scotland should fail to get a qualified majority backing its membership application, so this is excellent news!